This is a blog that I have created for my 5 grandchildren. I have a daily Scripture verse or two along with comments and questions. Hope this encourages young people to read in their Bible every day and to meditate on God's Word. 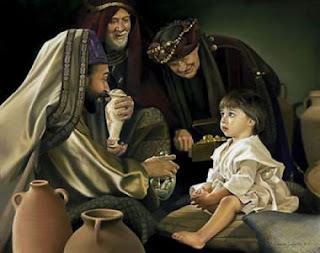 Matthew 2:11-15 And when they were come into the house, they saw the young child with Mary his mother, and fell down, and worshipped him: and when they had opened their treasures, they presented unto him gifts; gold, and frankincense, and myrrh. And being warned of God in a dream that they should not return to Herod, they departed into their own country another way. And when they were departed, behold, the angel of the Lord appeareth to Joseph in a dream, saying, Arise, and take the young child and his mother, and flee into Egypt, and be thou there until I bring thee word: for Herod will seek the young child to destroy him. When he arose, he took the young child and his mother by night, and departed into Egypt: And was there until the death of Herod: that it might be fulfilled which was spoken of the Lord by the prophet, saying, Out of Egypt have I called my son. It must have been quite a sight to see those royal Wise men bowing down upon their knees to a little baby boy! But baby Jesus was no ordinary baby boy. Jesus would be the Savior of the world! And Satan knew it. Satan wanted to destroy Jesus before He went to the cross. So Satan used wicked King Herod to try to kill baby Jesus while he was just a baby. Herod told the Wise men to bring him word back about the newborn king. But God was protecting His Son from the wicked king and warned the Wise men to leave another way and not to tell King Herod. Satan had plans, but God had greater plans. And God still has great plans – plans for me and for you! Matthew 2:1-3 Now when Jesus was born in Bethlehem of Judaea in the days of Herod the king, behold, there came wise men from the east to Jerusalem, Saying, Where is he that is born King of the Jews? for we have seen his star in the east, and are come to worship him. When Herod the king had heard these things, he was troubled, and all Jerusalem with him. At the birth of Jesus, Luke described the shepherds and the angels, but Matthew described the Wise men coming to see baby Jesus. That is because Matthew was concerned with Jesus, the King of Israel. The Wise men had no idea that they were starting huge controversy when they asked King Herod about the new king that was to be born in Israel. Herod was jealous, but kept a straight face and told the Wise men that he wanted to worship the new baby king himself. NOT! Herod wanted the Wise men to find the new baby king so that he could kill him and protect his throne. Herod had no idea that the new baby King was a spiritual King Who would save everyone and establish a spiritual kingdom. Matthew 1:18-21 Now the birth of Jesus Christ was on this wise: When as his mother Mary was espoused to Joseph, before they came together, she was found with child of the Holy Ghost. Then Joseph her husband, being a just man, and not willing to make her a publick example, was minded to put her away privily. 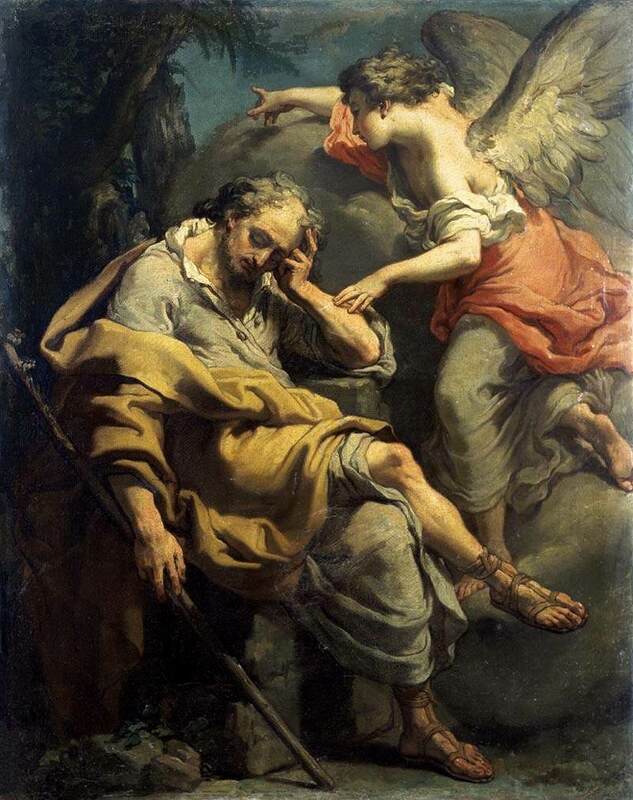 But while he thought on these things, behold, the angel of the Lord appeared unto him in a dream, saying, Joseph, thou son of David, fear not to take unto thee Mary thy wife: for that which is conceived in her is of the Holy Ghost. And she shall bring forth a son, and thou shalt call his name JESUS: for he shall save his people from their sins. Joseph and Mary were engaged to be married. But Joseph had a dilemma. mary became pregnant before they were married. Joseph thought that Mary had been unfaithful to him and was considering breaking their engagement. He didn’t want to embarrass Mary, but he had to do the right thing. But before he made his decision, an angel came to him in a dream and explained that Mary was going to birth the Son of God. Mary would bear the promised Messiah, the deliverer of Israel and the Savior of the world. The angel’s message to Joseph was at just the right time. And the Savior, baby Jesus, was born at just the right time too! Matthew 1:1 The book of the generation of Jesus Christ, the son of David, the son of Abraham. Almost a thousand years before Jesus was born, God promised King David that he would have a son who would rule and reign as king forever and forever. 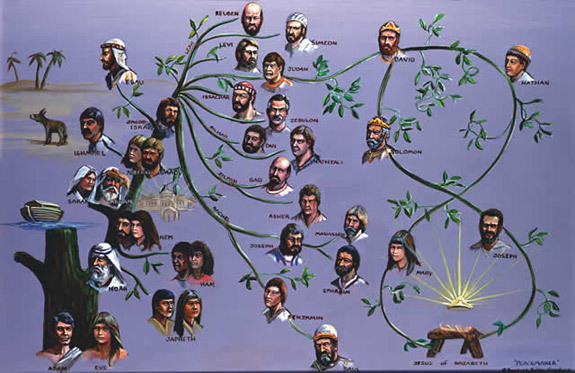 So Jesus had to be a descendant of King David. Matthew takes Jesus’ ancestors through his father, Joseph. The usual way that a throne passes is from father to son. But we know that Joseph was not really Jesus’ father. So the book of Luke traces Jesus’ ancestors from King David down to Mary, Jesus’ mother. Either way, Jesus had the right to sit on the throne of King David. But Jesus was actually the Son of God and the Son of King David. And someday, Jesus will rule and reign as King of kings and Lord of lords. And if you are a follower of Jesus, you will reign with Jesus! What a wonderful time that will be! 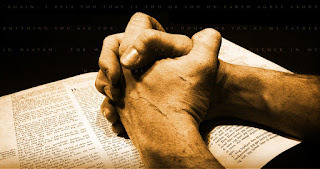 Ephesians 6:18 Praying always with all prayer and supplication in the Spirit, and watching thereunto with all perseverance and supplication for all saints; At the end of Paul’s description of the Roman soldier prepared for battle, he makes the application. Just like the soldier has to be ready for battle, so too we as Christians must be ready to do battle against Satan with his tricks. But we are not going to win in the battle against Satan. He is much stronger and wiser than we are. But, Satan is no match against the Almighty God! And our key to victory is to trust in God. We must let God fight for us! That is why our verse speaks about prayer and supplication. Supplication means to plead with God for a request. We need to pray, not only for ourselves and for our battles, but we need to pray for other Christians and their battles. While we are in the middle of a spiritual battle, so are missionaries in Africa, and Romania, and Venezuela. We should pray for our victory, but also for the victory of others. As our verse says, praying always. 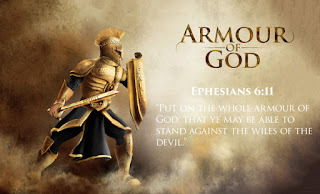 Ephesians 6:14-17 Stand therefore, having your loins girt about with truth, and having on the breastplate of righteousness; And your feet shod with the preparation of the gospel of peace; Above all, taking the shield of faith, wherewith ye shall be able to quench all the fiery darts of the wicked. And take the helmet of salvation, and the sword of the Spirit, which is the word of God: I can just see that Roman soldier all ready for battle that the Apostle Paul was talking about. 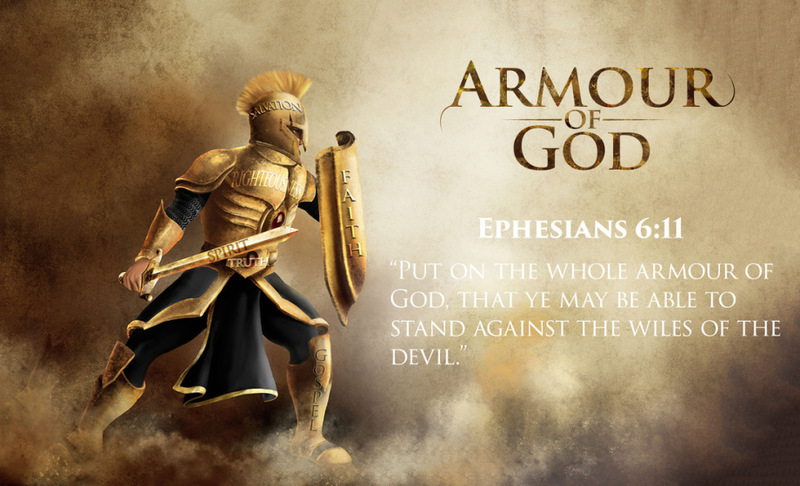 Paul was using the Roman soldier and his armor as an example of how we should be prepared to battle against Satan every day. Satan is a smart enemy. He has been defeating Christians for a long, long time. But God has been at it longer than that! And we are on God’s side! Say amen to that! It is interesting to note that all of these items were defensive weapons - all but one: the Sword of the Spirit, which is the Word of God. And, just like that Roman soldier had to practice and be ready for battle, we too must read and study and meditate upon the Word of God so that we might be ready for Satan’s tricks to defeat us. But Satan is a loser! If we use God’s Word, just as Christ did when Satan tempted Him three times, we will win! Satan cannot stand against the powerful Word of God. And if we are to be good Christina soldiers, we must use the powerful Word of God too! Trust God; He will never let you down!